Reuben Smiley finally got the notice of a scout, the scout coming out to watch him play. Smiley, though, started poorly, Smiley recalled later to The Los Angeles Times. After a pop out, a ground out and a strike out, the scout called Smiley over: Smiley just needed to keep his eye on the ball, follow through, Smiley recalled to The Times. "My next time up, I hit the second pitch for a home run," Smiley told The Times in June 1988, "and ever since then I thought I would be playing for him." Smiley did go on to play for the scout, or at least the scout's organization, the Giants. The Giants went on to think highly enough of Smiles to take him in the third round of that year's draft. But, in a pro career that spanned a decade Smiley never got to play for the Giants in San Francisco, or any other major league team. Smiley's pro career began that June, with the Giants taking him out of Los Angeles Community College. Smiley, whose name has also been spelled Rueben Smiley, started with the Giants at rookie Pocatello. There, he got into 50 games, hitting .286. In one late-June game, Smiley picked up three hits and two RBI. 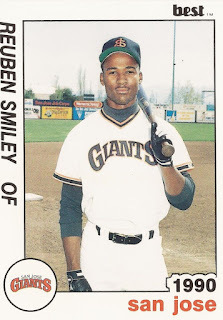 Smiley moved to single-A Clinton in 1989, then high-A San Jose in 1990. At San Jose, Smiley hit .266 with 25 stolen bases. The next year, at AA Shreveport, Smiley hit .230, but stole 36. Smiley got his first look at AAA Phoenix in 1992, 17 games. He would return to Phoenix the next two seasons, hitting .300 each year. But the outfielder never got his call to San Francisco. Smiley moved to the Padres and Royals organizations in 1995, but it was his last year of affiliated ball. Smiley then played two seasons in the independent Western League, with Long Beach in 1996 and Mission Viejo in 1997, ending his career.